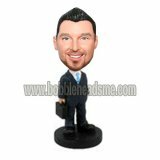 Custom bobbleheads fast,Personalized bobbleheads from photo.Dressed in a blue suit, this custom businessman bobblehead doll is holding a briefcase by his right hand.This is the best git for a Businessman,many clients bought this for their husband,and good feedback.Highly recommended!! 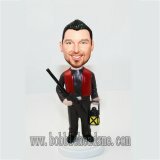 Loved this bobble head! It was a gift for my boss, and he was thrilled with how much it looked like him. The seller took a lot of time and went over each detail and step with me. Highly recommend this website! Great quality and a solid piece! Love this bobblehead on my desk! Do not hesitate to order-fair price, quick shipping, good product!